“Credit unions are all about promoting financial wellbeing and good money habits, so we welcome the Government’s new Help to Save scheme. This entry was posted in Association of British Credit Unions, News and tagged abcul, Credit unions, Help to Save on March 15, 2016 by Ethos public relations news. ABCUL – the Association of British Credit Unions Limited – has welcomed the Scottish Government’s backing in its campaign to make access to credit union savings and loans a standard workplace benefit. A new report – “Scotland’s Credit Unions: Investing in our Future” – published on 10 February outlines the Scottish Government’s support for making payroll deduction partnerships between employers and credit unions as popular in Scotland as it is in other countries like the United States. ABCUL Chief Executive Mark Lyonette said: “It’s no coincidence that the world’s most successful credit union movements have close links with employers, making saving and repaying affordable loans really easy for people via payroll deduction. The First Minister of Scotland Rt Hon Nicola Sturgeon MSP has written a letter to employers highlighting the benefits of working with credit unions. Nicola Sturgeon writes: “The Scottish Government recognises the valuable role played by credit unions in building financial health by providing financial services and products to a wide range of customers. There are over 100 credit unions in Scotland serving 375,000 people who are saving £454 million and borrowing £276 million. This entry was posted in Association of British Credit Unions, Credit unions, News and tagged abcul, Credit unions, Scotland, Scottish Government on February 10, 2016 by Ethos public relations news. The Ministry of Defence has made it possible for three of the UK’s leading credit unions to join forces and make simple savings accounts and loans available to the Armed Forces and their families. The arrangement means that Armed Forces personnel will be able to save regularly or repay loans with a credit union via payroll deduction. Family members and retired personnel in receipt of a pension are also eligible to join. The launch of this service is being marked with a celebration at the head office of the Royal British Legion in London on Thursday 15 October, which is International Credit Union Day. A new website – www.joiningforcescu.co.uk – is also being launched with details of the services offered to Armed Forces personnel by the three credit unions and links to join. Over the years, Armed Forces personnel have reported difficulties accessing credit because their job involves moving regularly and it can be challenging to build a good credit rating. For this reason, some personnel have reported being actively targeted by high cost lenders. The appetite to facilitate regular saving and affordable borrowing for Forces personnel saw the Government exploring payroll deduction partnerships with credit unions, and following an application process, three of Britain’s largest and most successful credit unions – Plane Saver Credit Union, Police Credit Union and London Mutual Credit Union – have been selected to offer this service to Forces personnel. Police Credit Union Chief Executive Peter Evans said: “The three credit unions are honoured to offer our services to Armed Forces personnel, and it is a great example of credit unions working co-operatively with each other and with the Ministry of Defence to deliver a service to the men and women of the Armed Forces. Minister for Defence Personnel and Veterans Mark Lancaster MP said: “I’m delighted that credit union services will today be available to Armed Forces personnel. It is crucial that those service people who work so hard to keep Britain safe, both at home and abroad, can access easy and affordable ways to save and borrow. One of the first people to join a credit union under the new arrangement is Lance Sergeant Johnson Beharry VC. 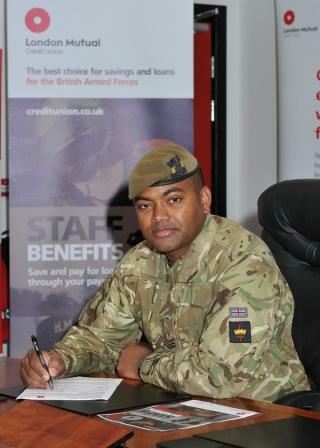 Lance Sergeant Beharry – who became the first living recipient of the Victoria Cross since 1969 for saving the lives of his comrades in Iraq – has joined London Mutual Credit Union. Internationally, credit unions have a proven record of providing services to Armed Forces personnel. The largest credit union in the world, Navy Federal Credit Union, has offered savings, loans and a range of financial products to members of the United States Armed Forces and their families since 1933. Today, the credit union has around 5.7 million members across America and assets of $70 billion. Stay up to date with all the very latest news via www.twitter.com/JoiningForcesCU. This entry was posted in Association of British Credit Unions, Credit unions, News and tagged abcul, Credit unions, London Mutual Credit Union on October 15, 2015 by Ethos public relations news. ABCUL – the Asso ciation of British Credit Unions – has welcomed the passing of the Bankruptcy and Debt Advice (Scotland) Bill in the Scottish Parliament today (20 March). The Bill – which aims to deliver a debt advice, debt management and debt relief service which is fairer to creditors and debtors alike – was passed with cross-party support at the end of a long process of consultation which Scotland’s credit unions have closely engaged with throughout. Credit unions particularly welcome the adoption of a single common financial tool to calculate debtors’ contributions, the extension of money advice and financial education, and measures to curb the potential for unfair and inappropriate use of debt relief products. The creation of a Financial Health Service to support people with debt problems and build financial capability across the country more widely has also been welcomed by Scotland’s credit unions. ABCUL Scotland Policy and Relations Manager Frank McKillop said: “A credit union loan comes from other people’s savings, so the principle that people who can repay do repay is especially important to credit unions. This entry was posted in Association of British Credit Unions, Credit unions, News and tagged abcul, bankruptcy legislation, Credit unions, Scotland on March 20, 2014 by Ethos public relations news. The latest edition of Credit Union News, which we have been working on for our client ABCUL, has been published. This special edition celebrates the 50th Anniversary of credit unions in Britain. 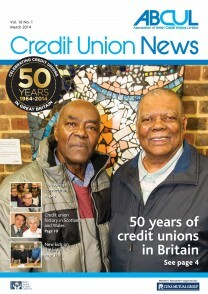 The first two credit unions – Wimbledon Credit Union and Hornsey Co-operative Credit Union – both started in April 1964, and the magazine includes an interview with two of the founder members of Hornsey Co-operative Credit Union. There is a timeline showing how the credit union sector in Britain has developed over the last 50 years and an interview with credit union activist Martin Logan, who has played a key role in helping to record the history of credit unions in this country. There is also a look ahead to the future, with a feature on some of the “new kids on the block”: Polish Credit Union UK, Churches Mutual Credit Union and Retail Credit Union are three new credit unions taking the sector forward. The magazine goes out to ABCUL members and many others with an interest in the credit union sector and is published three times a year. A copy of the latest issue can be downloaded from our publications page. This entry was posted in Association of British Credit Unions, Publications and tagged abcul, Credit Union News, Credit unions, magazines, news, publications on March 18, 2014 by Ethos public relations news. ABCUL welcomes Lloyds Banking Group support for credit unions. Lloyds Banking Group has re-emphasised its commitment to providing leadership in the area of financial inclusion by announcing its intention to provide £1 million per year to credit unions. It has also committed to support 1 in every 4 of Britain’s social banking customers. This announcement falls during the week the Group revealed its full Helping Britain Prosper Plan where, for the first time, it revealed seven separate and significant public commitments to address some of the big issues facing Britain today. Minister for Welfare Reform Lord Freud said: “Credit unions play a vital role in helping people build up savings and have access to loans, especially those who find it difficult to have mainstream high street bank accounts. This is why we are investing £38m to help credit unions modernise and grow. Lloyds Banking Group commenced a pilot in September 2013 through 25 Lloyds and Halifax branches in the Leeds area to signpost appropriate customers to the Leeds City Credit Union and local money management charities. Over 1,000 customers to date have taken away information about these organisations. The approach of the pilot programme, which was due to end this month, has been adopted on a permanent basis and will be expanded to a further nine UK flagship locations with the cascade of basic information becoming available through all Lloyds and Halifax branches. Chris Smyth, Chief Executive, Leeds City Credit Union, said: “Credit Unions play a critical role. We know this from our pre-Christmas trading and coinciding with the Lloyds pilot, was 25% higher than the prior year. In this period our lending was almost £2m. This represents a terrific saving in terms of interest of £1.3m had these loans gone to a high cost lender instead. Lloyds Banking Group is Britain’s biggest provider of social bank accounts. This entry was posted in Association of British Credit Unions, Credit unions, News and tagged abcul, Credit unions, financial inclusion, Lloyds Banking Group, social banking on March 13, 2014 by Ethos public relations news. The latest issue of Credit Union News, which Ethos public relations has been working on for our client ABCUL, has now been published. The magazine, which goes out to ABCUL members and many others with an interest in the sector, is published three times a year. 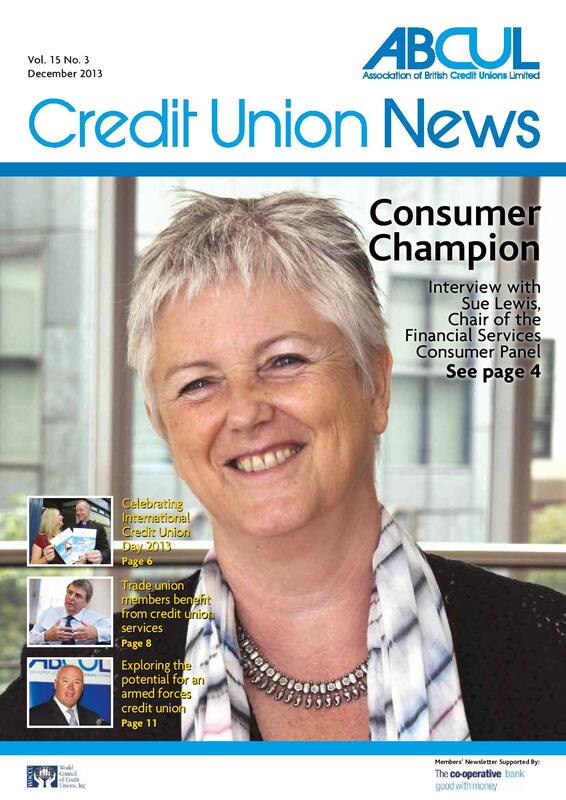 In this issue, there is an interview with Sue Lewis, Chair of the Financial Services Consumer Panel, who explains what the panel does and her views on credit unions and the financial services market. There is a look back at all the celebrations which took place on International Credit Union Day on 17 October, when over 40 bishops got involved with their local credit union. There is also a feature on the links between credit unions and trade unions and the important role that trade unions have played in helping to set up and run credit unions. A copy of the latest issue can be downloaded from our publications page. This entry was posted in Association of British Credit Unions, Publications and tagged abcul, Credit Union News, Credit unions, magazine, news, publications on January 6, 2014 by Ethos public relations news. Parliamentary staff, including MPs, can pay into a credit union via payroll deduction, thanks to a new service launched on Monday 25th November. Agreements with the Parliamentary authorities mean that anyone working in the Palace of Westminster can now join London Mutual Credit Union and save or repay loans direct from their wages. The initiative was launched at an event in Parliament hosted by the All-Party Parliamentary Group on Credit Unions and London Mutual Credit Union. Money saving expert Martin Lewis spoke at the launch and also became a member of the credit union. Credit union partnerships are a cost effective way for employers to enhance the financial well being of employees and payroll deduction makes saving and borrowing easy and convenient. The Parliamentary authorities are the latest in a long list of employers to offer this benefit to their employees. Staff working for the police force, public transport employers, British Airways and the NHS are just some of the people who already enjoy the convenience of payroll deduction. Martin Lewis said: “With the growth scourge of payday lending across the UK – credit unions are a viable, cheaper, non-profit local alternative and should be encouraged. Therefore today I hope to be excited at the launch event to see senior MPs and even Government Ministers giving the London Mutual their backing by joining up and making use of the deduction facility. It’ll be interesting to see who puts their money where their mouth is. Credit unions are financial co-operatives, owned by their members, which provide safe savings, affordable loans and a range of other financial services to over a million people in Britain. London Mutual Credit Union is the largest community credit union in London. It serves over 20,000 members in the London Boroughs of Southwark, Lambeth, Westminster and Camden. Members have access to a range of savings and loan products, including the Credit Union Current Account and a cash ISA offering 3% AER. This entry was posted in Association of British Credit Unions, Credit unions, Events, News and tagged abcul, credit union, LMCU, London Mutual, MPs, Parliament on November 24, 2013 by Ethos public relations news. We’re pleased that the latest issue of Credit Union News, which we have been working on for our client ABCUL, has now been published. The magazine, which goes out to ABCUL members and many others with an interest in the sector, is published three times a year. 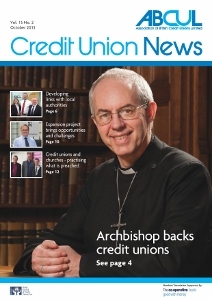 In this issue, we look at the support for credit unions from the Archbishop of Canterbury, which hit the headlines in the summer, and we talk to Rev Dr Malcolm Brown, Director of Mission and Public Affairs for the Church of England, who is leading the church’s work on this. We also look at the work credit unions are doing to develop links with local authorities and we talk to Simon Blissett, Programme Director for the £38 million Credit Union Expansion Project, about the opportunities and challenges for the sector to deliver this project. This entry was posted in Association of British Credit Unions, Publications and tagged abcul, Credit Union News, Credit unions, magazine, news, publications on October 16, 2013 by Ethos public relations news.